Bobby Butler '12 is one of several Wildcat alumni who will compete in the 2018 Olympic Winter Games next month in PyeongChang, South Korea. Kacey Bellamy ’09 led UNH to a Hockey East Championship in 2008-09, and now she’ll compete in her third Winter Games, this time as one of the team’s assistant captains. Bellamy already sports Olympic bling in the form of two silver medals — one from the 2014 Games in Sochi, where she contributed a goal and an assist in five games, and one from the 2010 Games in Vancouver, where she contributed an assist. Robert “Bobby” Butler ’10 has been named to the men’s ice hockey team. A graduate of the College of Health and Human Services, Butler was named 2010 Hockey East Player of the Year during his senior year at UNH. Today he plays for the Milwaukee Admirals in the American Hockey League. Want to be moved to tears? Watch Butler deliver the news that he made the team to his father. Who was Ed Blood, Anyway? A 1935 graduate, Ed Blood was captain of the UNH ski team. 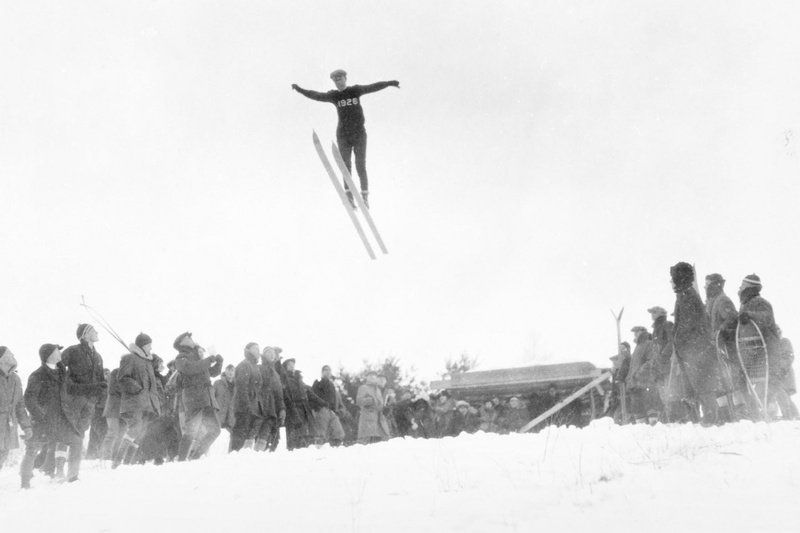 He went on to compete as a ski jumper in the 1932 and 1936 Olympics, one of many Wildcat athletes to achieve Olympic fame. Read about others in "One Hundred Fifty Remarkable Wildcats." Clare Egan ’12G will compete in her first Olympics as a member of the 2018 biathlon team. At UNH, Egan was the women’s Nordic team MVP and a member of the cross-country and track and field teams. She won the 3,000m steeplechase at the 2011 America East Championships. Egan is now the 13th Olympian in the history of the UNH skiing program. Annika Taylor ’15 has been named to Great Britain’s Nordic team. Taylor skied for the Wildcats during her time as a chemistry student at UNH, where she was two-time team MVP. During her senior year, Taylor compiled five victories, four second-place finishes and one third-place result. Noah Grove ’21 will take the ice in March as a member of the 2018 U.S. Paralympic Sled Hockey Team. Grove is a freshman in the College of Life Sciences and Agriculture. It’s his first appearance at the Paralympics, and in PyeongChang he’ll join veteran teammates, including eight who played on the gold-medal winning team at Sochi in 2014. Other alumni athletes will serve as staff at the Games. Tim Baucom ’09, a former UNH Nordic ski team member, will travel to PyeongChang as a U.S. Ski Team employee and coach, while his former Nordic teammate Andrew Morehouse ’09 will work as a service technician, collaborating closely with coaches and skiers to prepare equipment for competition. *Team members are still being selected, so stay tuned for potential Wildcat additions to this list!